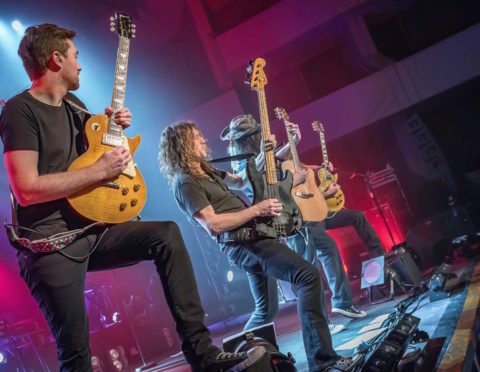 Susan Welsh saw The Classic Rock Show at Eden Court Theatre, Inverness. Outside, the mercury was plunging but at Eden Court it was hot, hot, hot as The Classic Rock Show raised the temperature inside the Empire Theatre. There was no protracted introduction. No, “It’s great to be back folks” but straight into the music, opening with a great version of Led Zeppelin’s Whole Lotta Love which rocked the theatre to the rafters. I can’t hear Zep’s classic hit without thinking of Top of the Pops as the show used it as its theme tune for years. It wasn’t until after the third song, an excellent cover of Stevie Nicks and Tom Petty’s Stop Draggin’ My Heart Around that anyone on stage actually spoke. Singer Johnny West stepped forward to remind the packed theatre that this was the third time they’d played here (the last being less than a year ago) and that they were delighted to be back. Although billed as “the classic rock fan’s ultimate live juke box” I think the title does it a disservice. It’s a chance to experience a noisy classic rock concert from the comfort of a chair, and see some rather brilliant musicians and singers show off their skills. The eight-piece band dazzled an audience of all ages with blistering versions of Steely Dan’s, Reelin’ in the Years; Cream’s Sunshine of Your Love and Jimi Hendrix’s All Along the Watchtower. The second half saw them crank things up to deliver an even louder and rockier set. Many of the numbers were played out in front of a large screen showing clips of the original artists, back in the day. David Bowie in his Ziggy Stardust Days; The Who with the late Keith Moon going nuts on the drums as well as numerous clips of long-haired rockers whipping themselves into a musical frenzy all made for an night that was, quite simply, fabulous. A well deserved encore saw them return to the stage and pull out all the stops to present a superb version of Joe Cocker’s, With A Little Help From My Friend and The Who’s Don’t Get Fooled Again.